“A McGill forum to discuss issues arising from these changes, co-sponsored by SSMU and University Services, will be held Thursday, Sept. 23, from 3:30 p.m. to 5 p.m. in the Ballroom of the Student Centre on McTavish St. The event will give participants a chance to air their views on where McGill’s mobility priorities should be focused in the weeks and months ahead and how different members of the community can reconcile what are sometimes competing needs. 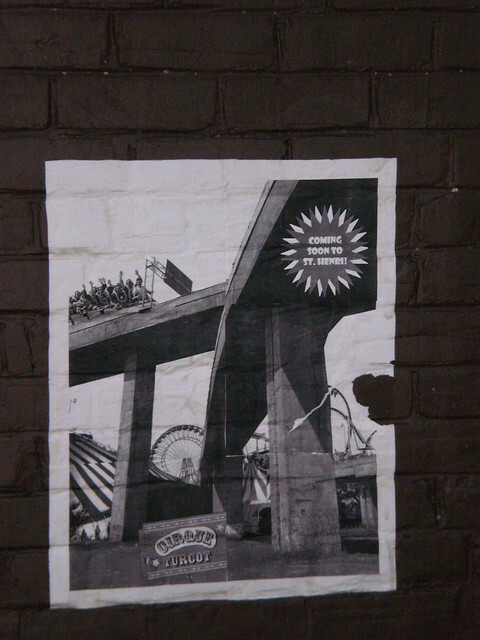 First of all, let me begin with a new updated version of the “Cirque Turcot” wheatpaste. I just gave it a slight tweak to make it look more like a circus poster. I don’t think I’ve ever used this blog as a ranting podium for my commentary on certain urban planning issues. Then again, there is a first time for everything, and as I get back into the swing of another academic year and have less time for streetart I’d like to round out my often-infrequent posting with a bit of analysis and commentary on ongoing Montreal projects and decisions. As of several months ago, the planning directors of Montreal’s McGill University decided that the streets of the lower campus were going to become a car-free zone- a decision which I wholeheartedly applaud. It was put forth with plenty of notice and opportunity for public consultation and input. What McGill’s planning board decided to do in tandem with this decision- prevent people from riding their bicycles on the lower campus streets- was not announced beforehand. This policy flies in the face of both McGill University’s past lobbying for safe, accessible bicycle networks (which University representatives carried out during consultations for the Montreal Transportation Plan) and McGill’s own Master Plan, which calls for “…a greener, pedestrian-friendly Downtown Lower Campus, as free as possible of motorized vehicles” and for an increase in the number of bicycle parking spaces on and near campus. The same Master Plan states that the Planning Office wishes to “…create people-friendly spaces that encourage conversation, reflection and the sharing of ideas”. I do not know how the Planning Office envisions this ‘sharing of ideas’ process taking place, but to me it involves a dialogue at the very least. And a dialogue has certainly not taken place. From what I have heard from friends who have attempted to contact McGill’s Planning Director, he has been ignorant and even hostile to their concerns. One friend who spoke to him personally said that he expressed an anti-cyclist frustration and mentioned his almost being hit by a cyclist in defense of his closing McGill’s Lower Campus to cyclists. But maybe that’s just hearsay. The director of the Planning Office hasn’t responded to an email I sent him expressing my opposition to his decision and the means by which it was carried out yet, but if and when he does I will add it as an update. Maybe he won’t think a street artist is worth talking to, but that’s not the issue here. The issue at hand is a decision made without public input that flies in the face of McGill University’s record and actions on bicycle use.